Fiction – Kindle edition; Hesperus Press; 128 pages; 2014. Translated from the French by Liedewy Hawke. Denis Thériault’s The Peculiar Life of a Lonely Postman is one of the most unusual love stories I’ve ever read. 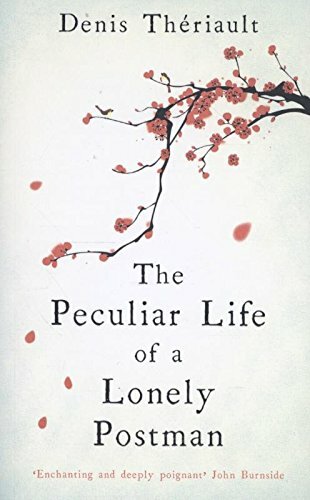 Part fable, part treatise on Japanese poetry, it also “flirts with the fantastic” (as the author states in a Q&A published at the rear of the book) and delivers a quietly understated story about the power of the written word and the Buddhist concept of Ensō. Set in Montreal, Canada (where the author hails from), we are introduced to the postman of the title: 27-year-old Bilodo, who lives on the 10th floor of a high-rise apartment block with his sole companion: a goldfish called Bill. He rarely goes out, preferring to stay home to watch TV or play video games, but he loves his job and is super-efficient at it. It wasn’t all roses, of course. There were those blasted advertising flyers to be delivered; the backaches, the sprains and other run-of-the-mill injuries; there were the crushing summer heatwaves, the autumn rains that left you soaked to the skin, the black ice in winter, which turned the city into a perilous ice palace, and the cold that could be biting, just like the dogs for that matter – a postman’s natural enemies. But the moral satisfaction of knowing oneself to be indispensable to the community made up for these drawbacks. Bilodo felt he took part in the life of the neighbourhood, that he had a discreet but essential role in it. But Bilodo has a bit of a moral blind spot. If he comes across a handwritten letter — an increasing rarity in today’s modern world — he takes it home, steams it open, reads it, makes a copy of it for his records, seals the letter back up again and then delivers it the next day as if nothing has happened. Through this illegal practise Bilodo stumbles upon a correspondence between Ségolène, a woman who lives in Guadeloupe (a French overseas territory, part of the Leeward Islands in the Caribbean), and Grandpré, an academic from Quebec. The pair send haiku poetry to each other and Bilodo, transported by the beauty of three lines of five, seven, and five syllables apiece, soon finds himself falling in love with Ségolène, a woman he knows he will never meet. And so he undergoes a psychological transformation that has him leading the peculiar life of the title. This short but powerful novella is deceptive in both its tone of voice (slightly mundane) and its subject matter (a dull man leading a dull life), but then about half way through it turns into something else entirely (although I will put up my hand and say that I predicted the major plot development that occurs). This is not one of those “happy” books where the lonely protagonist learns to live a more fulfilling life; there’s a really dark edge to it and a moral ambiguity at its core. There’s something about the whole “atmosphere” of the story that is hugely reminiscent of Japanese fiction: the functional prose style, the themes of alienation, chaste love and loneliness, and the lovely poetry in it, both haiku and tanka (the oldest and most elevated classical Japanese verse form). This is my 7th book for #20booksofsummer. I bought it in December 2014, partly because of Susan’s review at A Life in Books, for the princely sum of 99p. Delighted that this one hit the spot, Kim. What a bargain! Thanks for the link. It’s quite an old post but I’m pleased – and a little surprised – to report that it’s a popular one. I’d like to think a few more readers have got to know Bilodo as a result of it. I’ll add Strangers to my list. My copy was lurking for quite a few years, but I recently treated myself to a new Kindle and I’m enjoying working my way through my virtual TBR. Quirky is a good way to describe it, Stu. I enjoyed this too. It was the inclusion of the poetry element that made the difference. I have a copy of Strangers I believe…. I agree: the poetry added something special to the story. Do dig out that copy of Strangers; I think you will like it. In terms of subject, this sounds like a novel one of my book groups would enjoy. Would it make for discussion, do you think? Oh yes, I think you could have a good discussion about this, as it throws up quite a few moral dilemmas. I’m one of those few people who still sends handwritten letters, though not very often any more, even Mum has to make do with phone calls these days. Haikus though are much better suited to texting. As for my kindle, I haven’t switched it on since my last holidays, but I realise it would be ideal for books like this that I see reviewed but would have to order in if I were to read them (or more likely, add them unread to the stacks on the shelf) in paper form. Oops… sorry, I missed seeing this comment when it came in, Bill. I love that you still send handwritten letters. I spent most of my 20s as an obsessive letter writer (at one stage I had something like 40 penpals all around the world), but I no longer do so. I’ve even stopped sending postcards whenever I go away on holiday. Whenever I try to handwrite something now my writing looks like chicken scratchings as I do it so rarely. And yes, I only ever use purchase Kindle books if it’s far cheaper in Kindle format than paperback, or if it’s the kind of novel I’m not quite sure I’ll like. I loved this book and I agree about the unsettling but satisfying ending! I too am off to investigate Strangers. It was certainly a thought provoking ending… I’ve thought about it a lot since. And yes, you must read Strangers, it’s such a memorable and haunting novella. It does remind me of Japanese literature as the main character here is an outsider which you find so often in J-lit. Strangers is one of my favourites, too. Yes, it shares so many common themes/tropes with Japanese fiction, doesn’t it? I wondered if the author was a fan of Japanese fiction. In the Q&A at the back of this edition he says he taught himself haiku as part of the process for writing this book and spent many many months perfecting it, so I imagine he really got into the Japanese mindset even though he’s a French Canadian.